Considered one of the world’s greatest cocktails, this savory and, at times, restorative, drink is a meal in a glass. Whether you’re a Bloody Mary traditionalist or non-conformist, tomato juice never tasted as good as it does at any one of these awesome bars in New Mexico. This watering hole has been serving guests since 1939. It’s easy and relaxed, a take care of yourself kind of place, even when it comes to making your own libation at the Bloody Mary bar. Pair jalapeño infused Absolut with house-smoked bacon for a start and build from there. The bar is out on weekends and most holidays. Crab legs, cheese skewers, mini hot dogs, hot wings, bacon, shrimp and bread sticks are just a few of the items at this Blood Mary bar, that’s really more of a buffet. Choose your vodka, which is what you pay for, and customize your drink with as many skewers of food as you can manage. A meal and drink in one fell swoop. This is a barbecue place, so it stands to reason that the Bloody Mary would capture those flavors. It does. It starts with Tito’s handmade vodka and the restaurant’s signature smoky barbecue mix. Garnish with a slice of brisket and a couple of stuffed olives. That and an order of pulled pork slider makes happy hour…happy. This popular place to eat and drink is known for its flame-roasted green and red chile, the likes of which you might find as a garnish in their Bloody Mary. Aficionados of this tomato drink will love the spicy, tangy taste and those who like an extra kick can add a dash of Cholula kept on hand. This neighborhood bar and grill is a down-to-earth eatery that just makes and serves good food and drinks. The signature Bloody Mary comes with a hot jalapeño in place of a celery stick. Sunday brunch brings out a special food menu and the ultimate Bloody Mary bar where you can choose your own toppings. Yes, a cheese burger slider is an appropriate garnish! You might not imagine washing down El Salvadoran food with a Bloody Mary, but this is a taste sensation you don’t want to miss. It’s made with sake, adding a slightly fermented tang. It pairs perfectly with the Huevos El Savadorenos or green chile beef stew served daily. 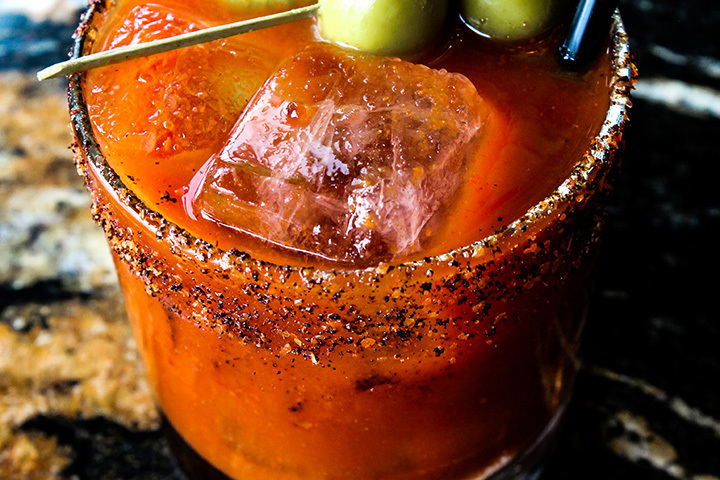 It’s a good bet that an award-winning distillery that makes its own vodka also makes a darn good Bloody Mary. It’s a bet worth taking. The house-made tomato juice and spice blend is hot and peppery with a dash of both Tabasco and Cholula. It’s embellished with a pickled green bean, Gibson onions and a selection of stuffed olives.